This is another one of those woefully overdue posts. 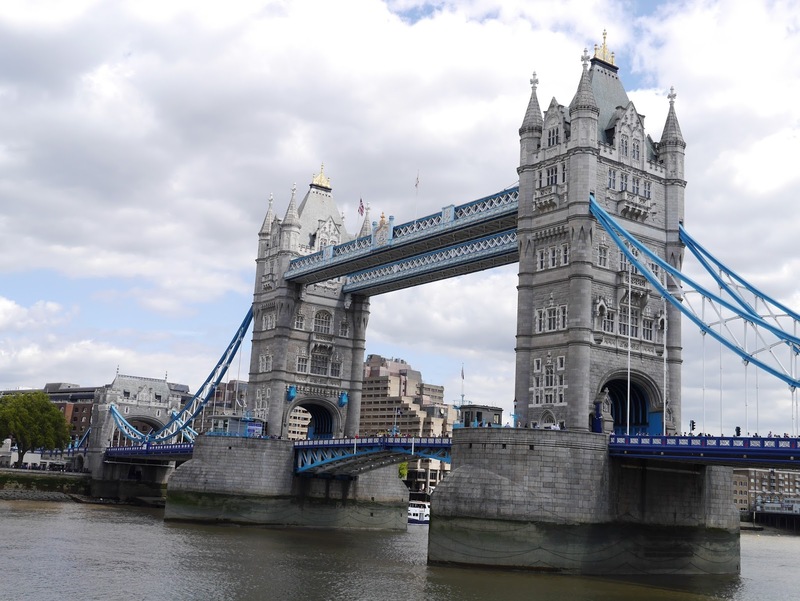 We went up to London at the end of August for the weekend as an end-of-summer treat for Lucas. 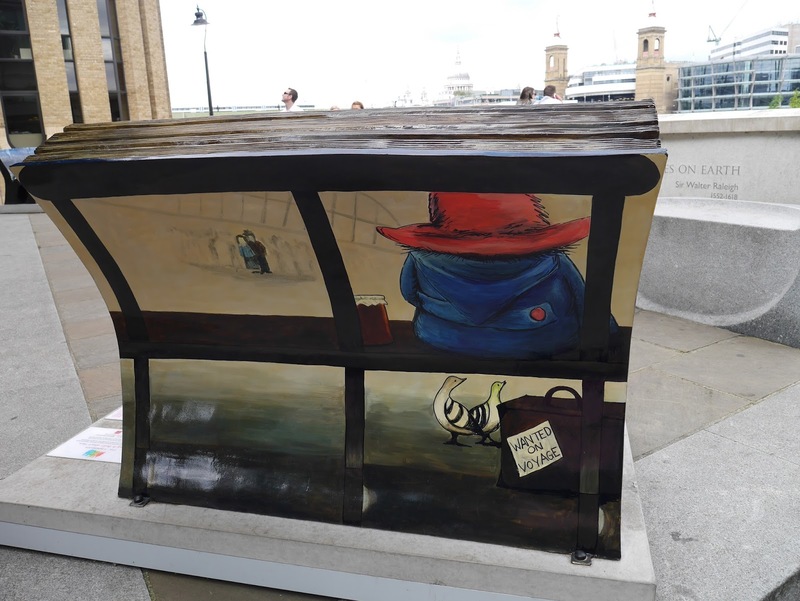 One of the big draws for me was the Books About Town book bench art trail around the city and we decided to combine tracking down benches with seeing some of the sights I've somehow managed to miss on my previous eleventy-million (slight exaggeration) visits to London. 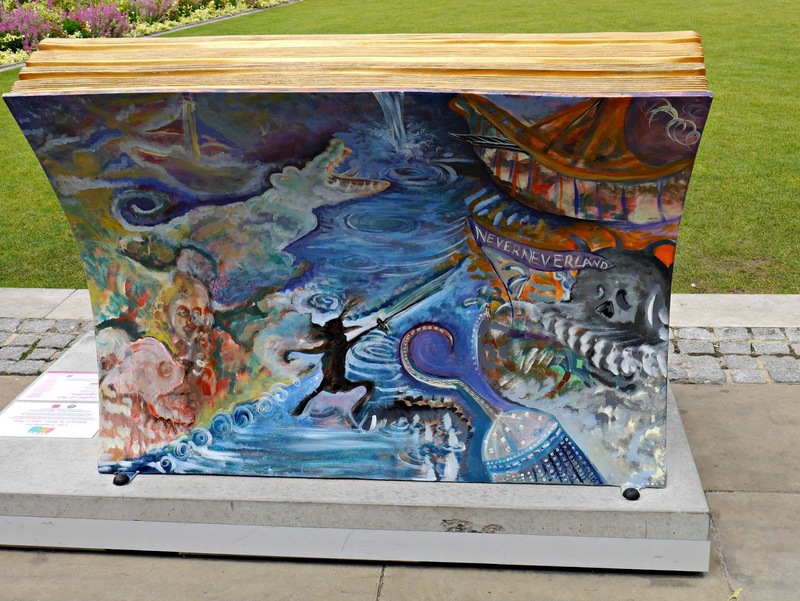 I love these art trails which are all the rage these days. 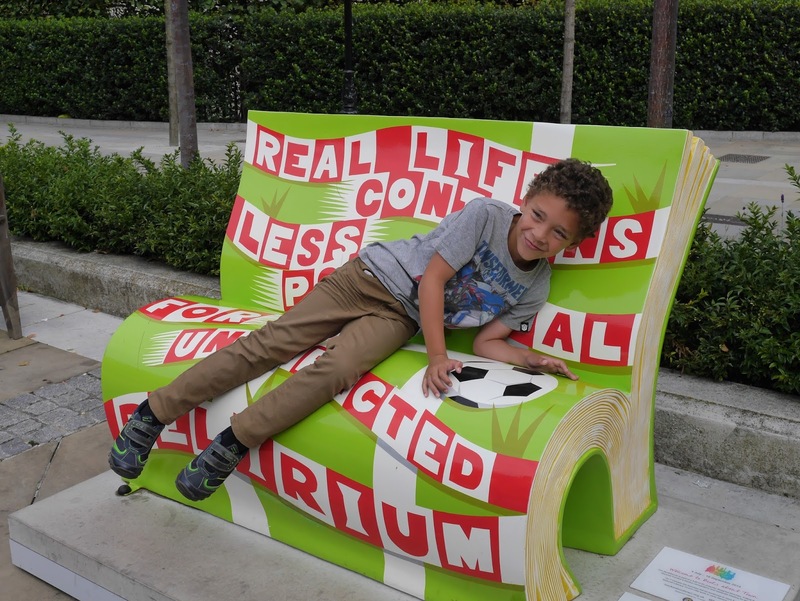 Gromit Unleashed was the highlight of our summer last year and as I love books even more than Gromit, I was all set to absolutely adore this one. 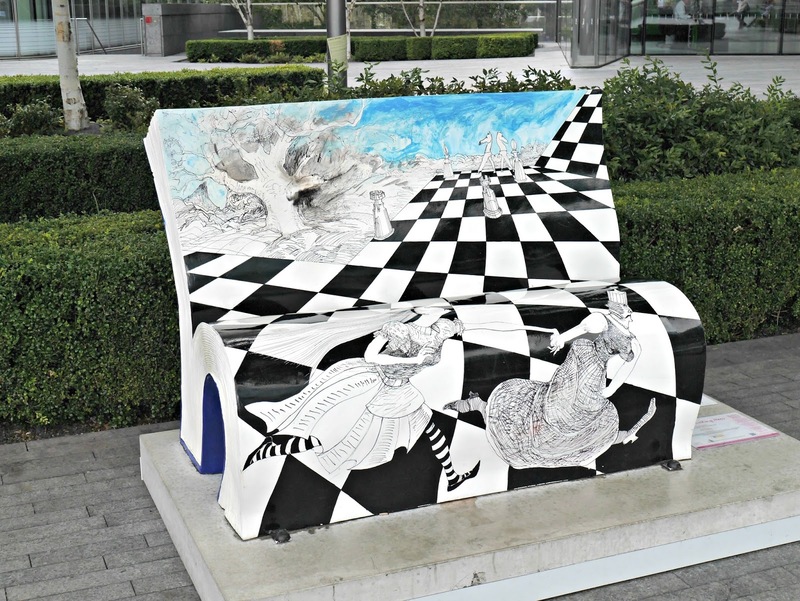 The trail is now over, however, the benches are all congregating for one last hurrah prior to the auction on the 7th of October. 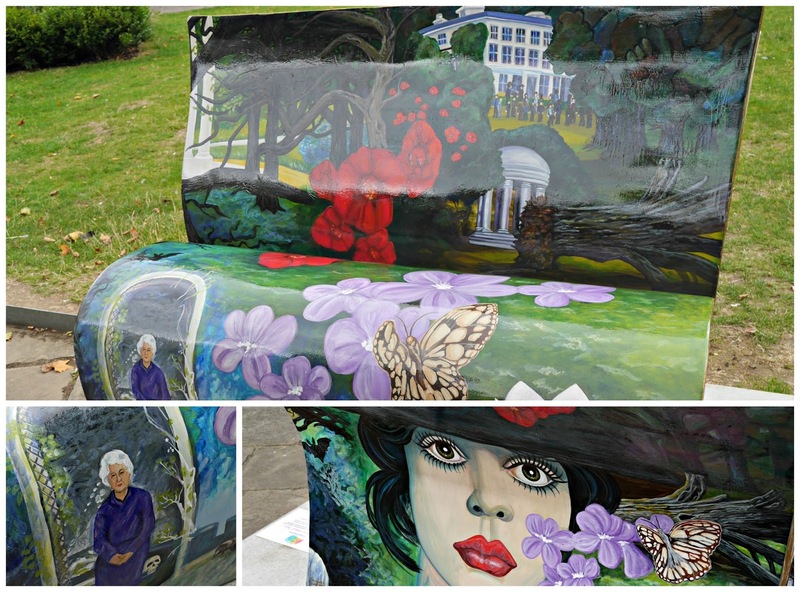 For this weekend (4-5 October, 2014) you can visit all of the benches at Gordon Square Garden WC1. 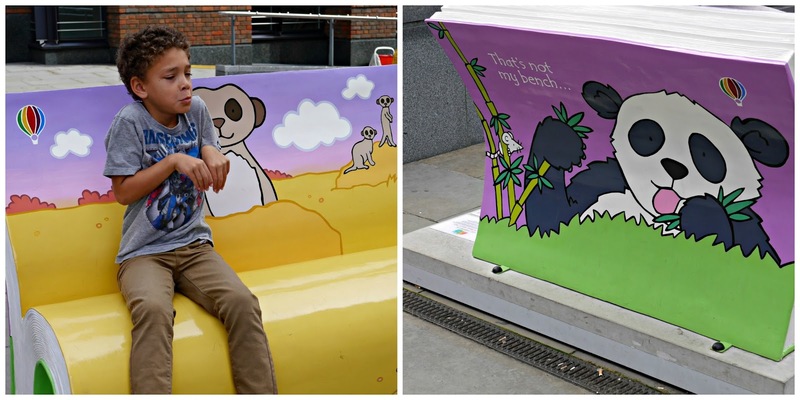 We found our first three book benches in the shadow of St Paul's. I had really wanted to walk around the cathedral and visit the Whispering Gallery but oh my god, the price. 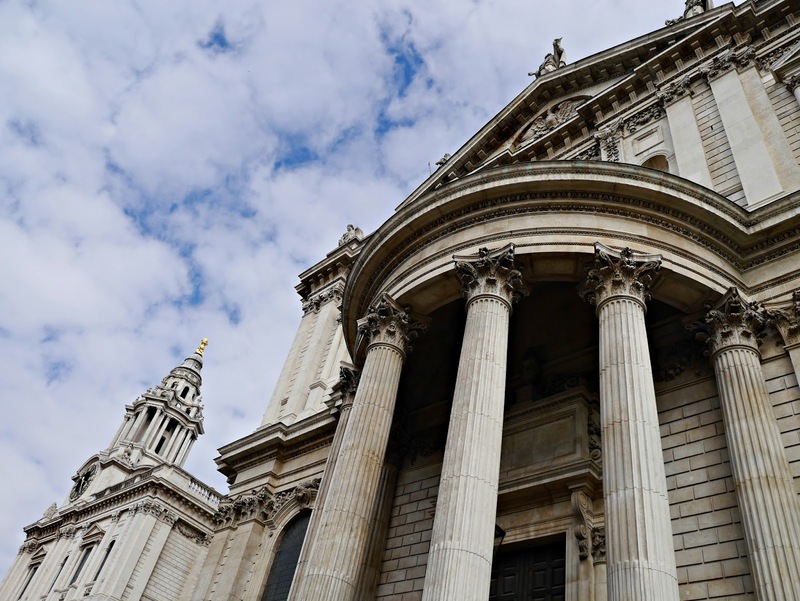 I'm still struggling with the concept of paying to go into a church, even more with the idea of spending almost £100 for a family of three. Still, there was plenty of gorgeous architecture for me to admire from the outside and once I'd had my fill, we went book bench hunting. 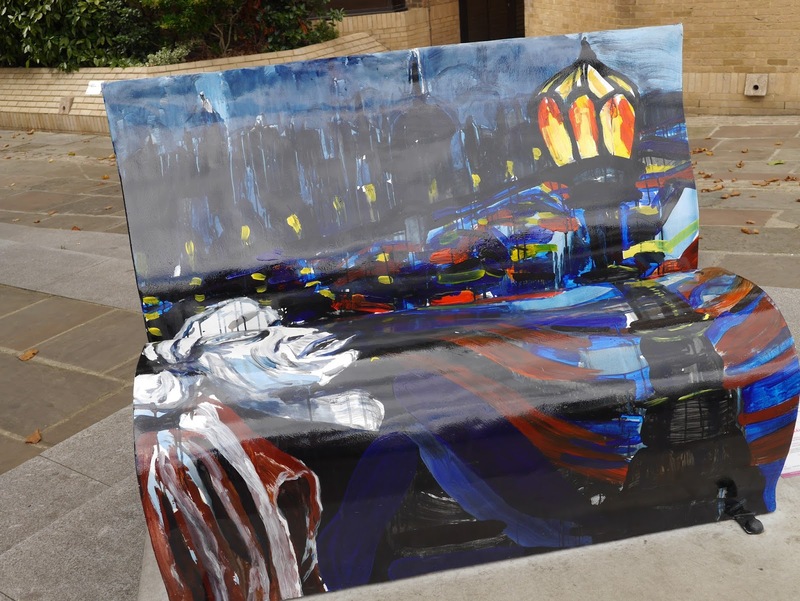 Our first bench was Mary Poppins. I almost wish we'd seen another one first, as this was such a disappointment to me. She looks wrong and nice. I appreciate that it's highly stylised--check out the cherry trees--but it just felt wrong for the book. Lucas wasn't very impressed, either. Still, things picked up dramatically with Nick Hornby's Fever Pitch just a few steps along the square. 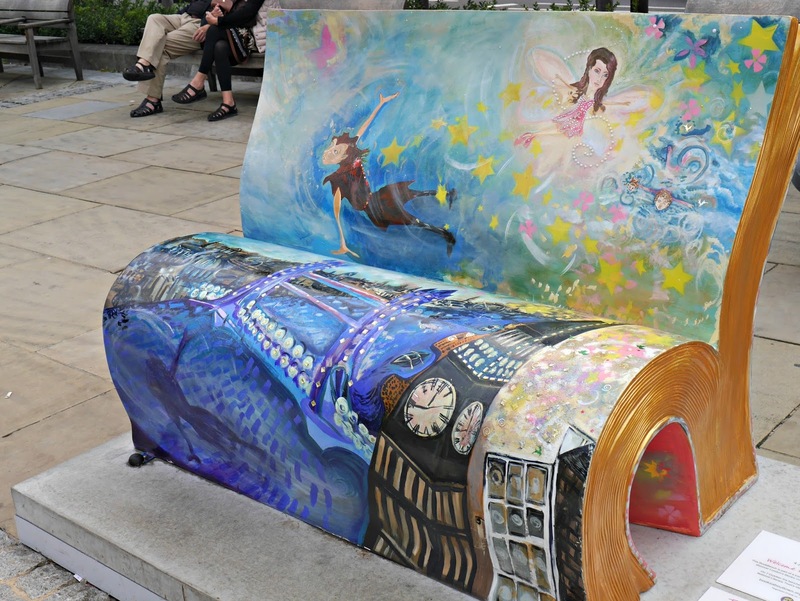 And I cooed over the Peter Pan bench for ages before I got dragged off to see the rest of The City. Isn't it perfect? So whimsical and the watercolours are perfect for the book. I love the gilt-edged pages and Peter's shadow is sword-fighting on the back! 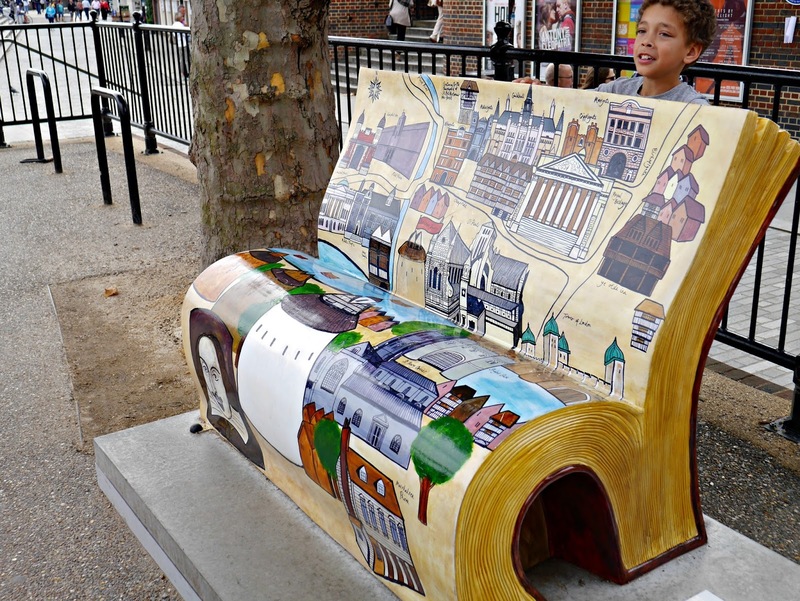 There turned out to be quite a few book benches near St Paul's. I bought the unofficial app as we strolled along to make sure we didn't miss any along the way. 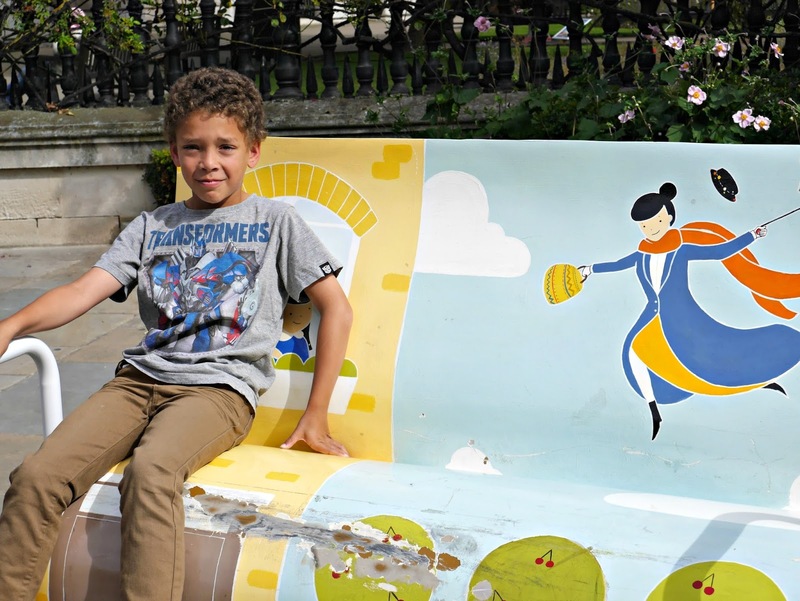 Lucas grew up with the Usborne "That's not my..." books so we all went a bit gaga over this bench. His crazy-obsessive meerkat phase may be be over, but he still does a great meerkat impression. Simples! We crossed the Millennium Bridge--did you know it was in the Guardians of the Galaxy film?--and headed towards The Globe. Another place I've never been to before! From The Globe, we walked down the Thames Path, enjoying the sunshine and the hunt. 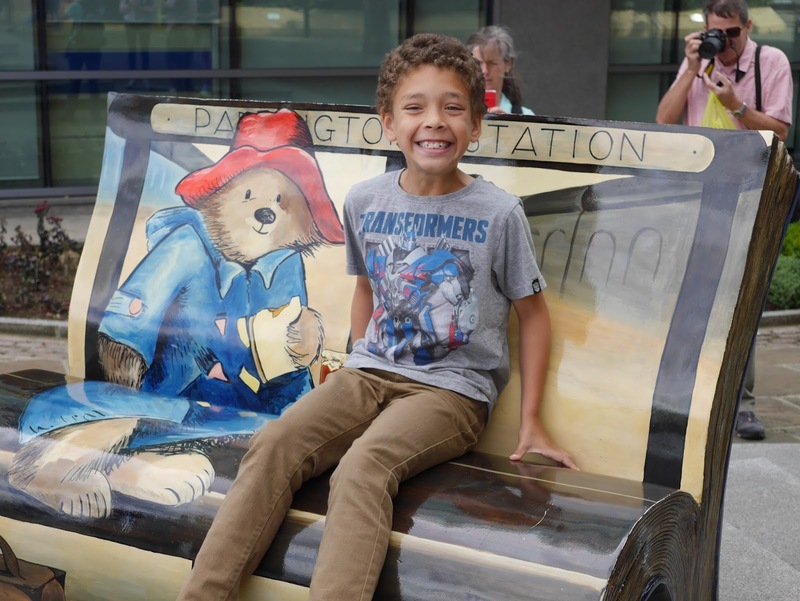 Lucas was pretty damn excited to find the Paddington Bear bench. Unsurprisingly it was really, really popular. There was actually a queue to take photographs! 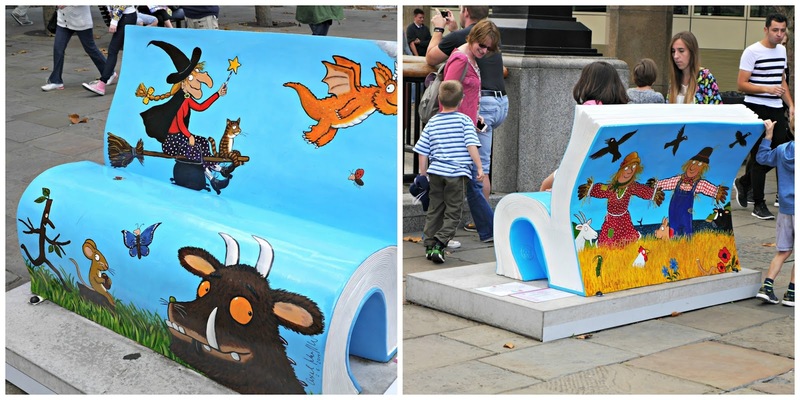 Another super-popular bench was Julia Donaldson and Axel Scheffler's From Scarecrows to The Gruffalo. It even had my favourite--Room on the Broom! It was such a lovely walk. 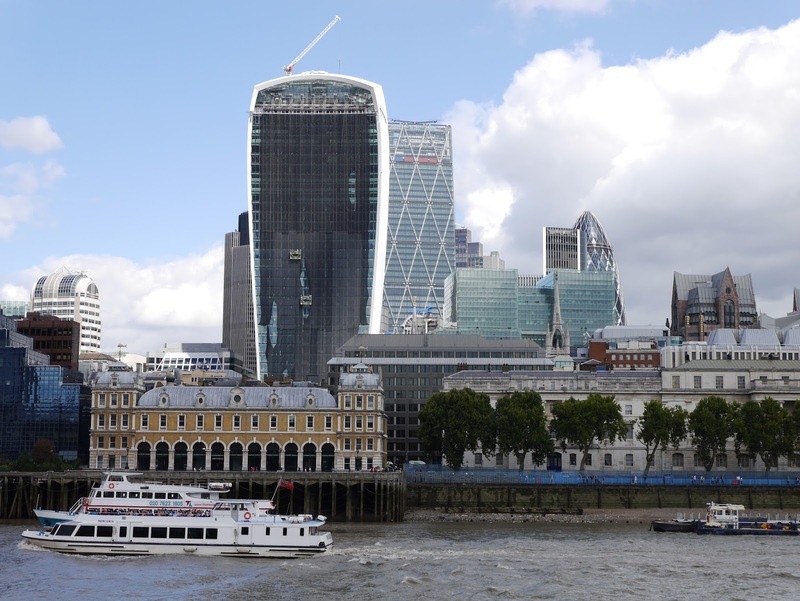 I've never seen the Square Mile from the Southbank so I was happily fascinated all the way. 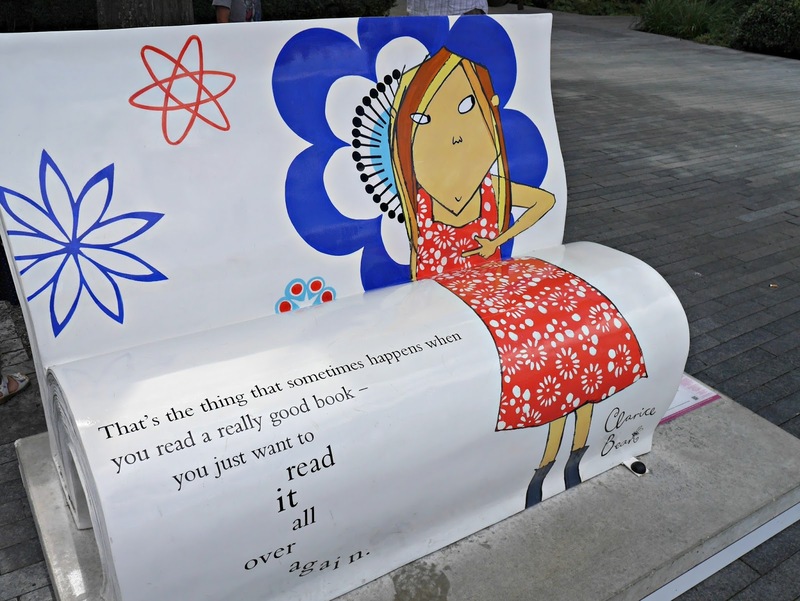 I didn't realise until the next day just how far we'd walked in our quest for the book benches!! After a pit-stop in Leon for lunch we started our quest again. Just outside the restaurant was the War Horse bench. 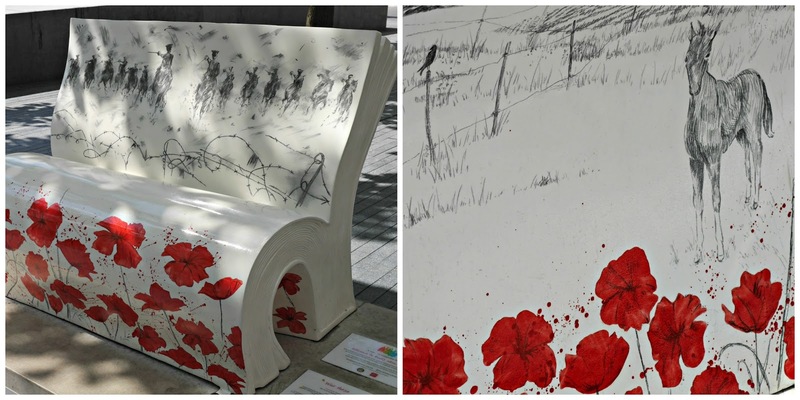 I've never read the book or seen the play, but the bench was certainly very poignant. Stark, simple and beautiful. 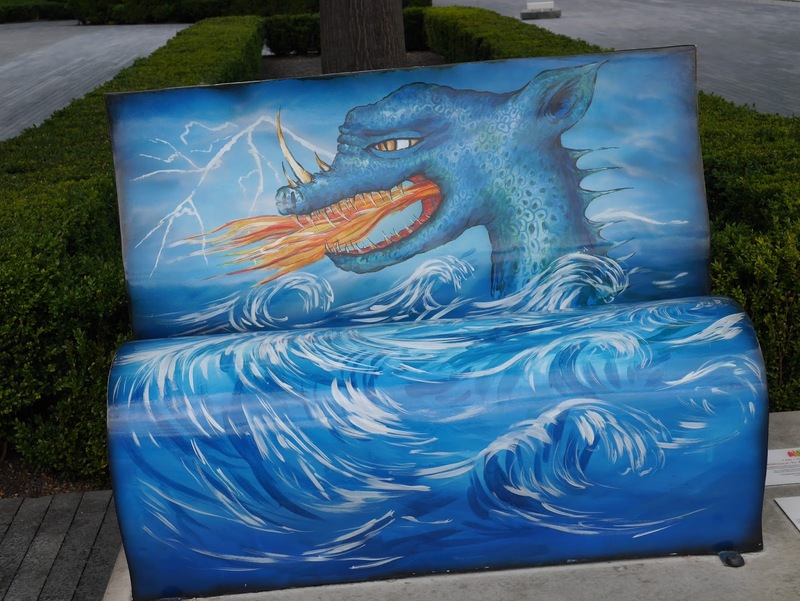 Here's my favourite bench of them all. 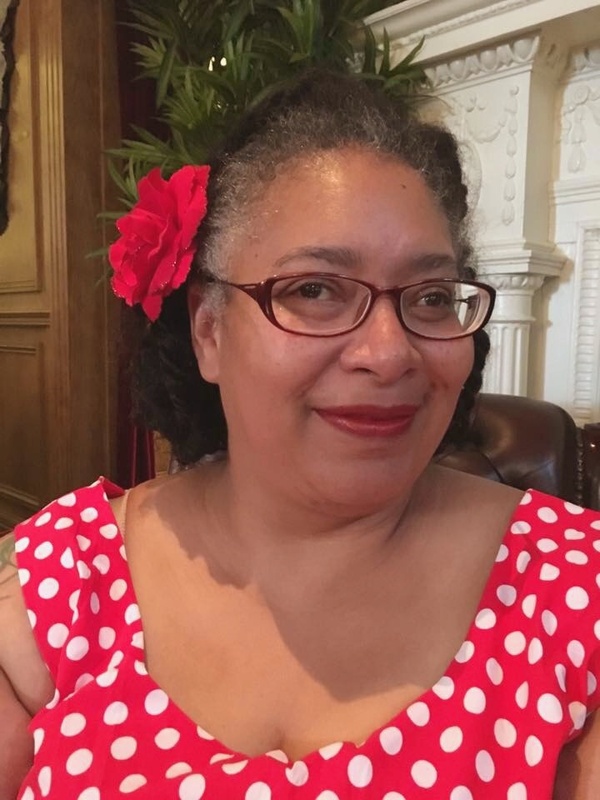 The Librarian of Unseen University in Ankh-Morpork. He seems to have the same approach to filing books as me. Stack 'em high! None of us had any idea that the How To Train Your Dragon movies came from a book! I was really surprised when I googled and found that there were loads and loads of them! I'm not familiar at all with Clarice Bean--I thought she was Lola from Charlie and Lola--but I agree with the sentiment. 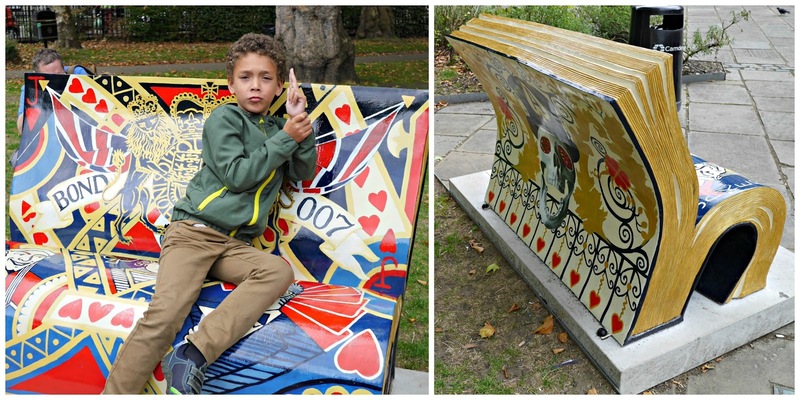 On Sunday we intended to track down loads more lovely book benches, but just after we'd found our first two in Russell Square it started to rain. Honestly, it was like the beginning of monsoon season. So there we were, the three of us sheltering under a not-very-big tree with one very small umbrella, no coats, and the rain absolutely soaking my back. We gave up on the benches right then and squelched off to Costa. There's a slight possibility that we might be fair-weather adventurers! So here are our last two. Lucas and Dave loved this bench so much. It's so wonderfully old-school Bond and super-cool. Our last bench was Hercule Poirot and the Greenshore Folly. This was an early short story which got expanded by Agatha into Dead Man's Folly and the Miss Marple short story Grenshaw's Folly. I'd love to read the original work at some point for fun! 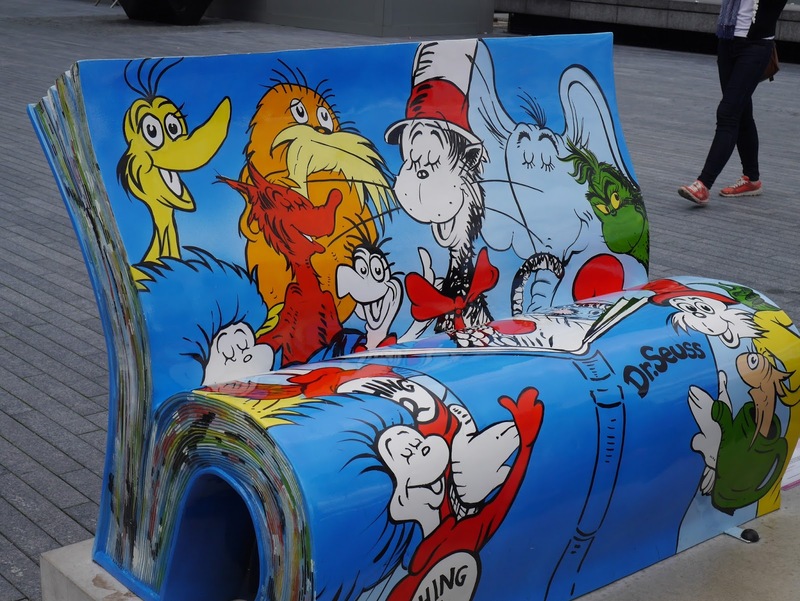 I really wish that I could go up to London and see the benches all laid out together. Hopefully a blogger or two will visit and take some beautiful pictures! These are gorgeous! 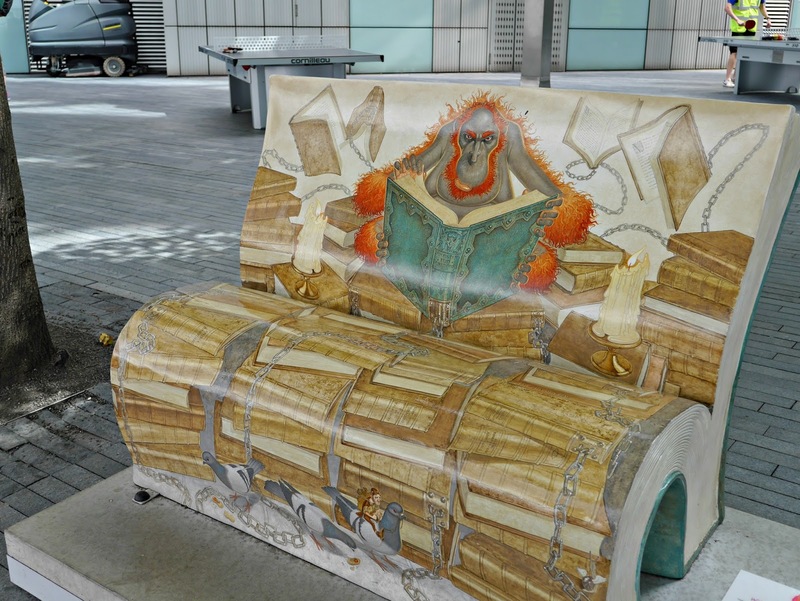 I agree that the Discworld one is probably my favourite, but the Warhorse bench has something very starkly beautiful about it. Fantastic photos! I think being in London was the biggest treat of all. Like me, Lucas still gets incredibly excited at the very idea of going to London! Dave spends way more time there than us, so he's a bit more jaded about it.